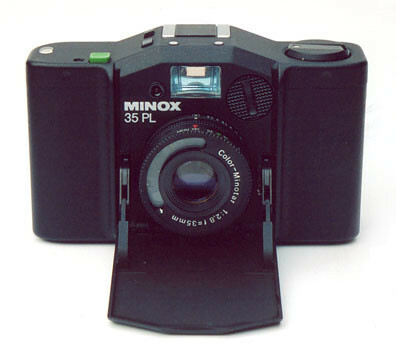 The Minox 35 range consisted of a series of tiny, full-frame 35mm viewfinder cameras. They became known as the World's smallest full frame 35mm camera. The ABS body has a folding front door covering a retractible lens, the front of the viewfinder and the battery compartment. Opening the door extends the lens and switches on the electronics. Most (all?) models had a wide 35mm lens, with scale focus. In the base is a ¼-inch tripod bush, the rewind release and the film speed setting dial )with a painted scale (only to 400ASA on some models) that easily wears off) and the back-release catch. The entire back and base plate detach for film loading. 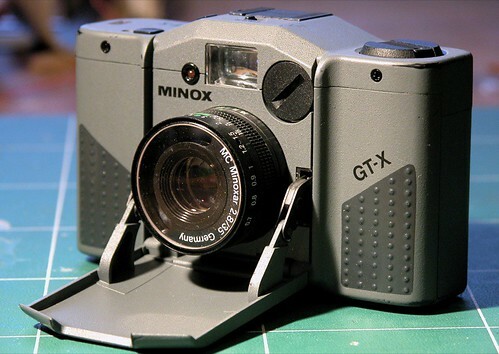 Minox produced a number of models - with various types of exposure control and other added features. The first was the 35 EL, introduced at Photokina in 1974. Most of the models were black, although some of the later ones were silver/grey, and there are white and green models. Each model can be distinguished by the colour of the shutter-release button (although some colours are quite close to others). Dedicated flash guns were available - fitting into the hot shoe and shaped to fit around the viewfinder bulge - with some small differences to take account of the design of the top plate. The flashguns were almost as big as the cameras themselves (and in some cases, completely covered the top plate, requiring an extra release button on the flashgun). This made handling much less slick. There were special models of many of the "main" models - mostly just changes in colour. ↑ see the picture a little way down on Submin.com- the TC35 and MT35 guns. ↑ User experience - I used one for about 10 years - User:Awcam. The Kiev 35A is a copy of a Minox 35. This page was last edited on 16 January 2018, at 19:42.